Erick Lindgren was arguably the best poker player in the world in 2008. He had just won his first World Series of Poker gold bracelet, cashed five times, made three final tables, and earned more than $1.3 million. Since then, Lindgren cashed only 12 times over the next four years at the WSOP. 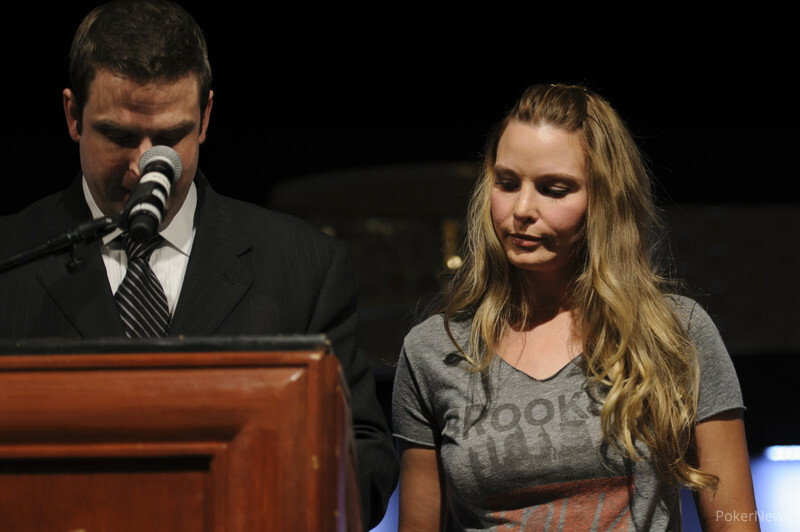 While his personal troubles have been well documented around the poker world in the last year or so, Lindgren is on the rebound both personally (In addition to getting married in 2011 to fellow poker pro Erica Schoenberg, the couple had a son later that year) and professionally. Entering Event #32, the $5,000 No-Limit Hold'em (Six-Handed), Lindgren already had four cashes in the 2013 WSOP. After his dominating performance today, Lindgren earned his second gold bracelet. Day 3 began with 14 players remaining from the starting field of 516. Lindgren began the day seventh in chips and doubled up immediately through Jonathan Little. From there, Lindgren was relentless and when the final table of six was reached, he was on top of the chip counts. Ryan D'Angelo exited in sixth place and he was followed to the payout desk by Vasile Buboi, who departed in fifth place. Both were eliminated by Connor Drinan, but after he doubled up Lee Markholt for a second time, Drinan was sent to the rail in fourth place. Jonathan Little was eliminated by Lindgren in third place, setting up a heads-up duel between Lindgren and Markholt. Though he began with almost a 4-to-1 chip lead, Markholt battled back. Over the course of the 70-hand heads-up battle, Lindgren surrendered the chip lead briefly on a few occasions. However, he battled back and sealed the deal with none other than pocket aces on the final hand. This marks Lindgren's second six-figure score in the last month, having finished second place at the WPT Championship in May for $650,275. If there were any doubts whether Lindgren was back as one of poker's most elite then, there certainly aren't now. Congratulations to Erick Lindgren on his second WSOP gold bracelet win, and thank you for following our hand-for-hand coverage and until next time, good night from Las Vegas! Hand #220: Lindgren limped in on the button, Markholt checked his option, and the flop came . Markholt led out for 110,000, but Lindgren cut out a raise to 275,000. 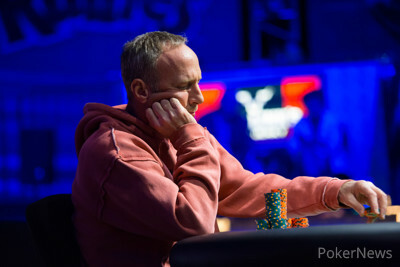 With his head now unshielded from the hoodie that had been protecting him all tournament, Markholt suddenly announced himself all in for his last 915,000. Lindgren snap-called and stood to table his , while his wife Erica and the rest of the rail exploded in celebration, their man having flopped top set with pocket rockets. A shell shocked Markholt could only shake his head and turn over the for bottom two pair, and while that hand would be a monster in any other spot, it was absolutely crushed here. Drawing only to running quad cards, Markholt was already shaking hands with Lindgren when the fell on the turn, and the on the river simply made things official. Markholt fell just short of his first WSOP bracelet, but his runner-up finish netted $374,960 for his 15th WSOP cash. Hand #215: Erick Lindgren reveived a walk. Hand #216: Erick Lindgren limped on the button and Lee Markholt checked his option. The flop fell and Markholt bet 110,000. Lindgren called to see the turn which both checked. The landed on the river and both hecked again and Markholt took down the pot with . Hand #217: Lee Markholt raised to 160,000 on the button and Erick Lindgren defended. The flop came down and Lindgren checked to Markholt who bet 160,000. Lindgren folded. Hand #218: Erick Lindgren raised to 160,000 on the button and Lee Markholt called from the big blind. The flop was and Markholt checked to Lindgren who bet 175,000. Markholt gave up his hand. Hand #219: Lee Markholt limped on the button, Erick Lindgren checked his option, and the flop fell . Lindgren check-called 110,000 from Markholt to see the turn and both checked. The river completed the board and Lindgren bet 150,000, forcing a fold from Markholt. Hand #210: Lindgren opened to 160,000, and Markholt flatted to see the flop. After Markholt checked, Lindgren bet 175,000, and Markholt grabbed a stack equal to 595,000, sliding it forward slowly for a raise. Lindgren announced himself all in after a moment's pause, but Markholt ended the drama with a quick fold. Hand #211: Markholt mucked his button, giving Lindgren a walk. Hand #212: Lindgren opened to 160,000, taking the pot down without a contest. Hand #213: Markholt opened to 160,000 from the button, Lindgren flatted, and the flop came . After a check by Lindgren, Markholt continued with a bet of 160,000. Lindgren surrendered, and the pot was pushed to Markholt. Hand #214: Lindgren continued to lean on Markholt, raising to 160,000 from the button, and he called to see the flop come . Both players tapped the table, and the arrived on the turn. Markholt led out for 160,000, and Lindgren made the call, bringing the on the river. Markholt fired a bet of 380,000 after a brief pause, and Lindgren stared straight ahead while contemplating his decision. He suddenly announced himself all in, and a difficult decision was put to Markholt. With a boisterous Gavin Smith arriving on the rail to serenade the Mothership stage with outbursts of support for Lindgren, hollering "the cavalry is here!," and heckling everyone in sight, Markholt eventually released his hand to the pressure play. Hand #203: Lee Markholt raised to 160,000 on the button and Erick Lindgren called from the big blind. The flop fell and Lindgren checked to Markholt who bet 140,000. Lindgren called to see the turn and checked. Markholt checked behind. The river was checked by both and Lindgren tabled for a pair of sevens, good enough to win the pot. Hand #204: Erick Lindgren raised to 160,000 on the button and Lee Markholt three-bet to 460,000 from the big blind. Lindgren folded. Hand #205: Erick Lindgren received a walk. Hand #206 Erick Lindgren limped the button, Lee Markholt checked his option, and bet 110,000 at the flop. Lindgren folded. Hand #207: Lee Markholt raised to 160,000 on the button to and Erick Lindgren called from the big blind. The flop fell and Lindgren led out for 150,000. Markholt folded. Hand #208: Erick Lindgren raised to 160,000 on the button and took down the pot. 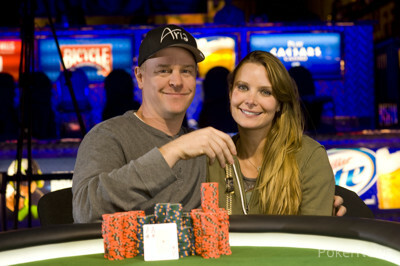 Hand #209: Lee Markholt raised to 160,000 on the button and won the pot. Final Day of Event #32 (No-Limit Hold'em Six Handed) is Set to Start! Day 2 of Event #32 ($5,000 No-Limit Hold'em - Six Handed) is in the Books! Jack Effel presents winner photo to Erick Lindgren, winner of Event #32: $5,000 No-Limit Hold'em (Six Handed). Shown here with wife Erica.